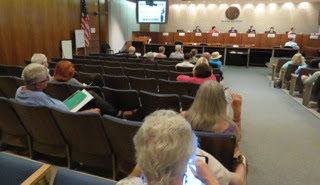 Costa Mesa City Councilwoman Katrina Foley hosted another "Get Connected" event last night in City Council Chambers at City Hall to inform residents about the status of the Lions Park Project and provide a primer with a panel of experts on the Group Home issue. 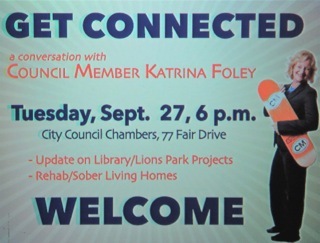 Foley led off the event, which ran for two hours, was attended by around 40 people. The crowd fluxuated depending on the issue being discussed. She gave a brief background about her earlier event, then a quick summary of what would be covered at this one. 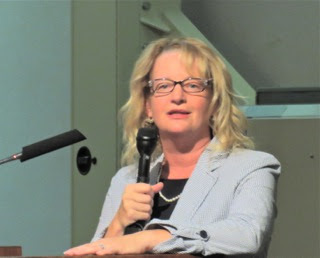 She introduced the panelists: Tarquin Preziosi, Deputy City Attorney; Sherri Vander Dussen, Interim Assistant Development Services Director; Fidel Gamboa, Chief of Code Enforcement; Rob Sharpnack, Chief of Police; Rick McNeil, Attorney and John Stephens, resident and attorney. First up was City CEO Tom Hatch, who presented us with a brief summary about the Lions Park Project, which includes the demolition of the existing Neighborhood Community Center and replacing it with a two-story, $26 million library; the renovation and repurposing of the existing Donald Dungan Branch Library as a new Community Center and creation of an acre of parkland for community uses. He told us the Library would be state-of-the-art and that the new community center would provide for maximum flexibility and utility. 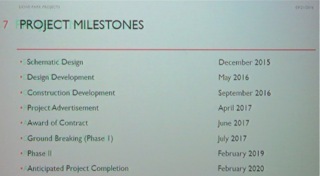 He told us the entire project would cost $36 million, half of which would come in the form of cash in a plan approved by the City Council on a 5-0 vote. 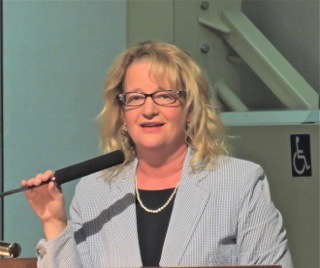 The remainder would come in the form of bond indebtedness, which would replace the current Victoria Improvement Bond of approximately $1.4 million per year. That indebtedness will soon be paid off. Questions were asked about the growing homeless population at Lions Park and their presence making it nearly unuseable by residents. Hatch's response was, "We have challenges there." Gee, no kidding! He said the new plan has a "security element" in it, but was not specific about it. 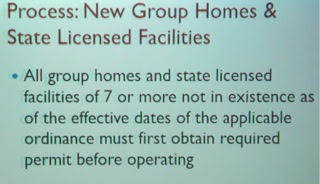 Another person asked about the current staff of the community center, and whether they would transition to the new one. The answer was affirmative. 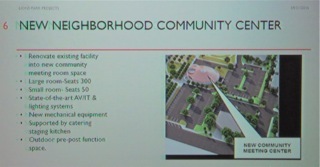 Another question was asked about renovating the current community center as an option. Hatch told us that, while it could be renovated for a couple million less, the return on investment of the new facilities and the usefulness to the community makes up for it. 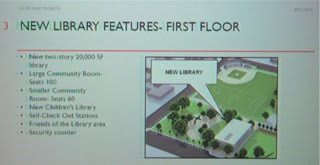 He also told us the County of Orange, which operates the library, has been a helpful partner in the planning process. 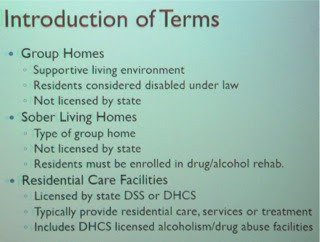 Next came the presentations about the Group Home/Sober Living Home issue. 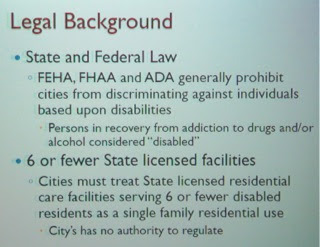 Foley reminded us that those among us fighting addiction should be treated with respect - they are protected by Federal Law as a "disabled person". Tarquin Preziosi began with a very informative slide show, all of which is shown here. I've presented these in order for you, so take your time as you scroll down through them. He handed it off to Interim Assistant Director of Development Services, Sherri Vander Dussen, who spoke about the current process status as shown on this slide. 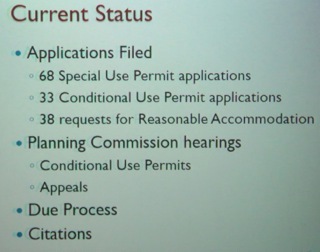 Many of those on this chart have been denied and are in the appeal process, an avalance that will hit the Planning Commission beginning in October. 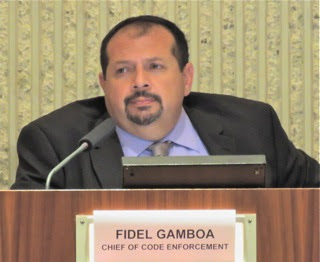 Chief of Code Enforcement, Fidel Gamboa, then took the ball. He told us his organization has sixteen (16) Code Enforcement officers housed on the 2nd floor of City Hall and at the Westside Substation, across the street from Lions Park. He explained how difficult it is to try to enforce our two ordinances designed to manage the Sober Living Home issue and suggested that residents contact State officials to get help with the State Licensed Homes. 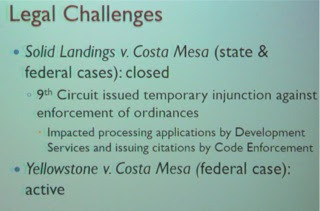 His presentation evoked many questions/comments from members of the audience. Foley was scampering around with the wireless microphone providing the opportunity for each to be heard. 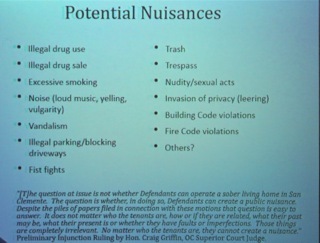 One resident provided an anecdotal story about her experience with a Sober Living Home in her neighborhood in which one of the residents took her cell phone and slapped her. 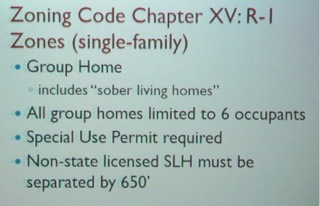 It was explained that one of the requirements for a Sober Living Home (see slide in Prezisoi's presentation) was to have a Good Neighbor policy in place. 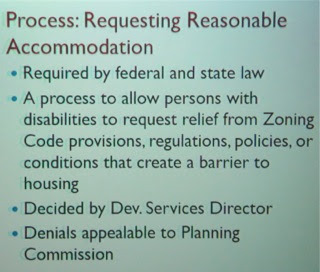 Another resident complained about letters being sent to her elderly neighbors instead of someone knocking on the door to advise them of code violations. 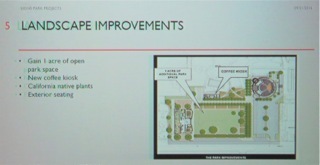 Perhaps the most interesting comment came from resident Art Goddard, who I will paraphrase by saying, "Many years ago Costa Mesa seemed to have more than our share of massage and tattoo parlors. Then came the homeless and we seem to have more than our share of them. Now we have group homes and we certainly have more than our share of them. He wondered what we have learned from all that experience that that will allow us to head off the next societal disaster?" Pretty good question. There was no answer. 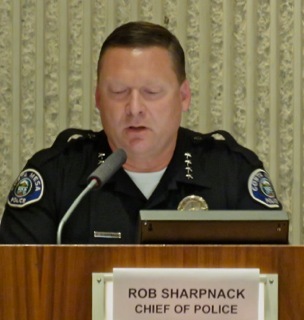 Chief Rob Sharpnack spoke about Crime and statistics. He told us that his organization works closely with Code Enforcement and the City Homeless group to try to manage the issue. 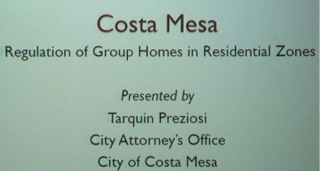 He did say that 25% - at least - of the homeless in Costa Mesa are Sober Living Home dropouts. He spoke about the kind of crimes some commit in order to get drugs - car breakins and thefts, home and business burglaries. He told us, "If you see something, say something." and to NEVER hesitate to call the police. 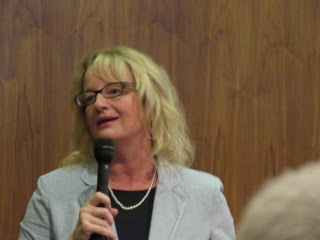 Sharpnack also spoke of the Neighborhood Watch Program - a great tool to help residents help law enforcement. 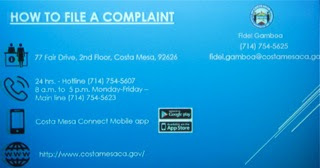 He told us the non-emergency number for the Costa Mesa Police Department - 714-754-5252 - and encouraged us to call it. 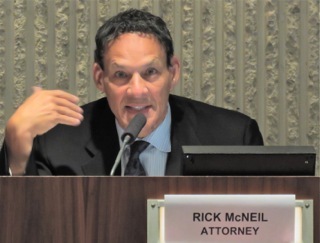 Next came Costa Mesa lawyer Rick McNeil, who apparently has had recent success in court in the city of San Clemente representing a Homeowners Association battling a "bad operator" - a group home in a gated community. 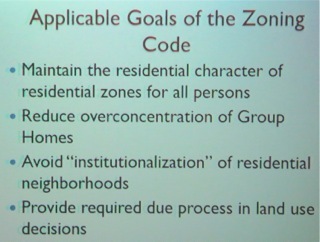 Resident, and City Council candidate, John Stephens followed his friend, McNeil, speaking about these issues as it might apply to Costa Mesa. Although questions were asked and answered during the presentations, several more were asked at the end. I'll try to give you a brief summary of some of the questions asked by members of the audience. One person asked about "camping" - referring to the homeless folks in our parks and elsewhere around the city. 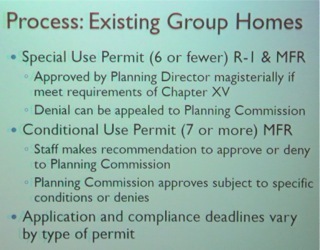 Foley said it's not against the law to "camp", except in parks where such activity is forbidden by posted ordinances. 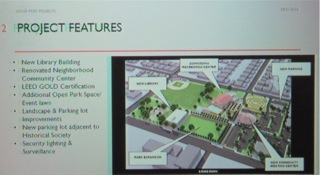 She spoke of Talbert Park, referring to it as being like "Survivor". 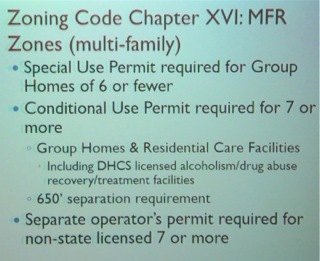 One resident praised the Sober Living Network, an organization she said was designed to "self-regulate" sober living establishments around the state to try to weed out the bad operators. She suggested that city officials reach out to that organization. Gamboa said they have. A resident wondered about the 650 foot limitation, and suggested that it might permit as many as 1200 Sober Living Homes in the city and wondered if it's possible to make the range 1,000 feet. 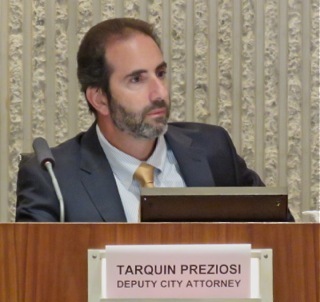 Preziosi suggested that it might have made the ordinance subject to court challenge because it was unreasonable - it might rule out any sober living homes in the city. The crowd cheered. Another resident praised McNeil for his work in San Clemente, then criticized Gamboa and his organization for taking citizen complaints lightly. She said some had been told, "You're the only one complaining. ", apparently not a fact. A question was asked of Sharpnack about the accumulation and compilation of statistics. He said their current system is due for an upgrade, so much of what might be done must be done manually by individual officers. 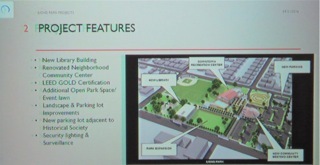 A question/comment was made about collaboration between city departments. 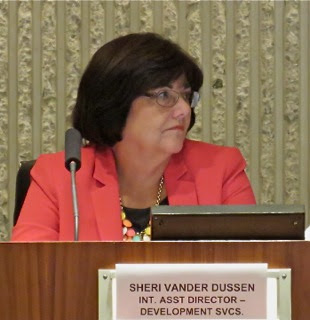 Vander Dussin said there is good collaboration. 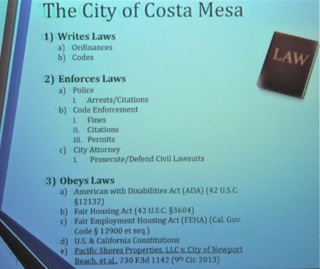 Preziosi said Costa Mesa leads the charge in ordinances. Then Robert Mann, who presented himself at the recent CM4RG Town Hall as the head of the aforementioned Sober Living Network, wondered about the consequences of filing frivolous complaints about Sober Living Homes. It sounded like a question intended to chill some activists. 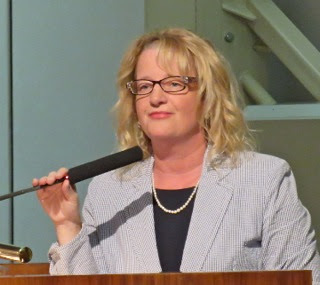 Stephens immediately jumped in to advise folks to not be deterred, and told them of the SLAPP laws that protect them from lawsuits to stifle public speech. 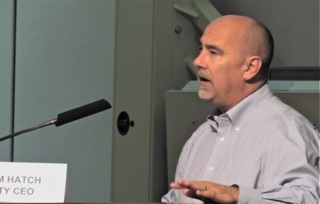 I know just a little about that stuff, since both Mayor Steve Mensinger and Mayor Pro Tem Jim Righeimer have attempted to have their lawyer quash my free speech rights. Foley closed the meeting just after 8 p.m. by thanking the participants on the dais and the audience who showed up ready to participate. It was a good turnout and an excellent program. Kudos to all involved. 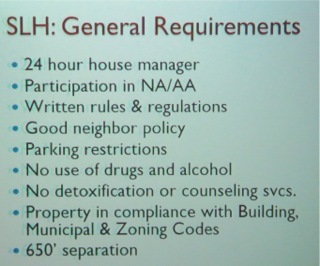 This meeting verified that the slh problem has no immediate answers or solutions. So yell all you want, they are here to stay and maybe even increase. 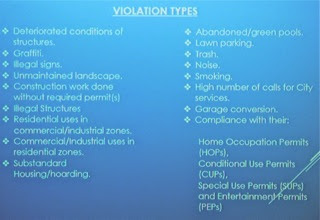 The current ordinance allows a SLH every 650 feet, according to the city that is 500 allowable, legally in R1...and I guess anither 500 in R2. 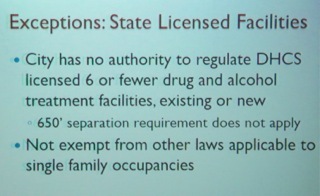 So the city acknowledges 168 slh's, unknown how many in actuality, but 1,000 legally. We haven't even begun to feel the full brundt of this issue. 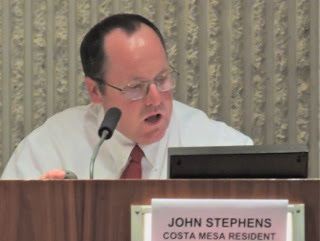 Stand by to stand by Costa Mesa, a "hmmm" moment, since Righeimer and Mensinger have been at the helm, this problem has skyrocketed. 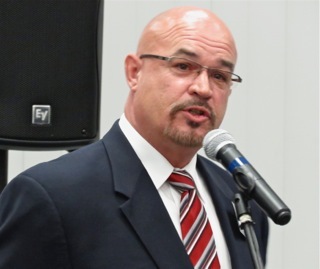 Could it be SCott Baugh's SLH lobbying experience has influenced his "buds" the Mayor and mpt? Why Costa Mesa, yeah, why? Costa Mesa has a problem. That's what happens when all people know how to do is wring their hands and wait for Big Brother to answer and lead the way in life. Our local PD, which is the San Bernardino Sheriff, simply pays no attention while the men in town, sit in front of it with very unfriendly attitudes, and simply deny them entry. What are they going to do? 15 to 1 is hard to argue with. Too bad for all of you guys. I am glad we still have property in different areas of Costa Mesa, but happy we moved here, rather than live in torment all the time.